Current vacancies in the Northern District of Florida (Gainesville, Panama City, Pensacola and Tallahassee) are listed below. The Northern District of Florida accepts only applications or résumés for current vacancies. The Federal Judiciary is committed to the national policy of ensuring equal employment opportunity to all persons. 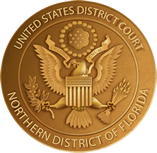 The federal judiciary and the district courts seek a diverse group of people with an interest in careers in the important work of ensuring equal justice under the law. The federal court system's personnel decisions are decentralized. This means that each court unit does its own advertising and hiring for job positions. Court unit heads generally control the hiring within their office so that chief probation officers, circuit executives, clerks of court, and circuit librarians each exercise such authority within their offices. Judges select and hire their own chambers staff. The careers range from information technology to human resources and case administration. Learn more about the various types of positions with the federal judiciary, benefits, compensation and current vacancies across the nation by exploring United States Courts Careers. Employment applications for law clerks may be processed through the OSCAR system. USAJOBS is the United States Office of Personnel Management website for employment vacancies in the Federal Government. STUDENTJOBS lists opportunity programs and positions for students and recent graduates.